This article details on how to point your GoDaddy Domain to your Host in 3 simple steps. By doing this, you will be able to create a website on your host and people will be able to reach it with your Domian Name instead of an IP address. To point your new domain to your hosting service you’ll need to log-in into your GoDaddy account. Remember you will need to write on your username and password. After that, look for the navigation menu and go to the Domains sub-menu. There, you’ll find whatever you need to setup your domains, transfer or even register a new one. In this case, you want to open your Domain Management Settings, so please click there and wait until the next page loads. Right after this, you’re going to be prompted by a menu where you can select your domains. If this is your first buy at GoDaaddy (and if you’re reading this guide you’re probably new) you should have only 1 domain. In my case, I’m selecting Stream-seo.com as my Domain. GoDaddy will show you the Domain information, along with the expiration date and forwarding settings. 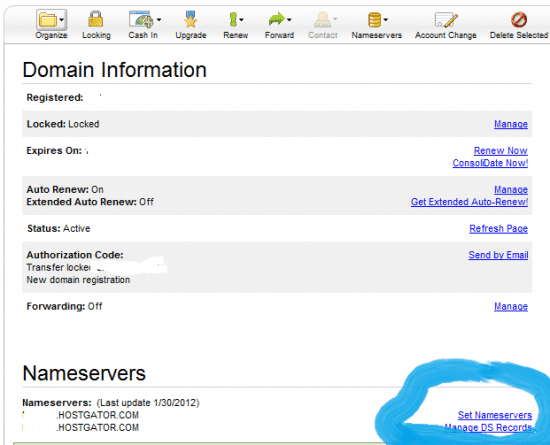 Scroll down to the Nameservers setup and click the “Set Nameservers” Button. You can forget about the rest of the options right now and leave them on default settings. A Name-server is a computer server that hosts a network service; DNS for this case. You need this information in order to point your DNS from GoDaddy to your Server, where you want to install your website or blog. Finding this information should be rather easy. First of all, you need to buy a Hosting Package, in which case, I went for HostGator as per many recommendations and their great 24/7 support. After I got my cpanel access it was just a matter of scrolling down to the account information menu and then look for the Name Servers. 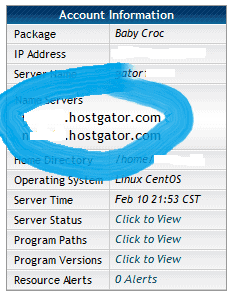 Your Name Servers should like like this: nsxxx.hostgator.com, and you’ve got to copy both of them, as your hosting service provides you with at least 2-4 Name Servers. Now that you’ve got your Name Servers go back to GoDaddy Name Server settings and select option number 4 (I have specific name servers for my domains) and fill the blank spaces with your name servers. GoDaddy forces you to input at least 2 name servers, so don’t worry about that. That’s pretty much all. After setting your Name Servers click OK and save your settings. Now you can log-out of your GoDaddy account and GoDaddy will process your request. This process usually takes around 30-60 minutes, but it can take up to 2 days, so please don’t panic if you don’t see your URL pointing to your Hosting Service right away. In the following articles, we’ll talk about how to setup your new domain in your host and install your Content Management System (WordPress) in order to create your website. Everyone know how to add domain with same hosting but few people know transfer domain on different Hosting. This post is very helpful who are unknown to transfer domain .